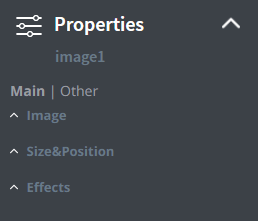 In the Properties Menu you can find Main and Other settings. Here you can find the specified settings of the selected element. There are also other settings, such as: Size & Position, Font and more. Here you can find more element specified settings. There are other useful settings such as: Effects, Animation, Data binding, Jump and the More Menu where you can find even further options.